Can you guess what it is yet??? Looks like a teacosy to me too! I knit one at school when I was 10. I remember the teacher handed out the wool and I got red and white. I didn’t like the colours. Wish I had it now though as those are the colours for Liverpool FC which my OH supports. My mum must have thrown it out!!!! And now you’re knitting Everton colours!!! Have you bought a dachshund? Haha - Trisha and LL - spot on. A pleated teacosy. 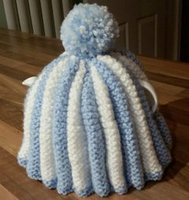 One of my OH's customers complained their teacosy was old and tired, so I thought I'd make them a new one! I've never made one before but it was fun to do. 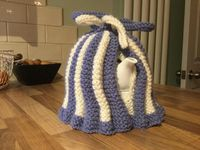 I didn't say tea cosy VW, because I didn't think you were the tea cosy type somehow, anyway, it is still very cute, and I am sure the recipient loves it. I make tea in a teapot day, to us it doesn't taste the same when it's made in a cup/mug. I always use a cosy, we have a charity shop that always has knitted cosies in. We used to have a tea room where every pot had It's own knitted cosy. 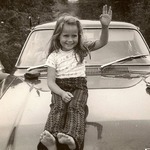 VW, I'm not surprised that you are getting requests to knit more. It's lovely. Thanks Trisha! I do have a pot tucked away in a cupboard, but tend to use my Tassino to make a hot drink on the odd occasion I have one at home. I am sure there are worse hobbies to become addicted to. So cute VW, you are so talented with knitting, wish I could do it.